Global markets rebounded, with volatility continuing to recede going into March, attributable to growing optimism surrounding the U.S.–China trade deal. U.S. employment growth fell sharply in February, signaling a slowdown in economic activity in the first quarter. The U.S. Q4 GDP growth beat market expectations, albeit lower than that of the previous quarter. The latest PMI and retail sales data also point to a softer outlook for the U.S. economy going into Q1 2019. Economic prospects in the Eurozone is expected to deteriorate as manufacturing activity continues to weaken. The UK government lowered its 2019 growth forecast from 1.6 percent to 1.2 percent, amid Brexit chaos and a slowing global economy. In global commodity markets, crude oil prices edged higher going into mid-March. 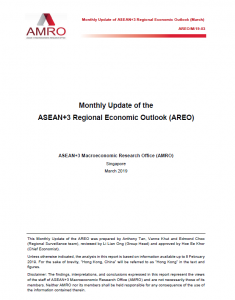 In the ASEAN+3 region, China’s persistently weak manufacturing activity signals slower growth going into 2019. Japan’s domestic demand and industrial production continued to fall along with contracting exports. Despite downward pressures in recent days, regional stock markets rose by 0.9 percent between 15 February and 13 March, led by China. Regional emerging markets posted net capital inflows in February, mainly into Indonesia. Regional currencies continued to appreciate in early-March.